The necessity for a second letter establishing the holiday of Purim implies that the initial letter was not fully accepted. Yet it is unclear why not, or what was added in the second letter to permanently establish the celebration of Purim. The only apparent new elements in the second letter are that while the first came from Mordechai, the second primarily came from Queen Esther. Further, a comparison is made between the Jewish people’s acceptance of the fast and their acceptance of Purim. The Ramban suggests that the Jews were still afraid and needed the authority of the queen to reassure them before feeling free to celebrate. However, there is no explicit mention of any lasting fear. The Ibn Ezra mentions three opinions about the reference to the fasts. 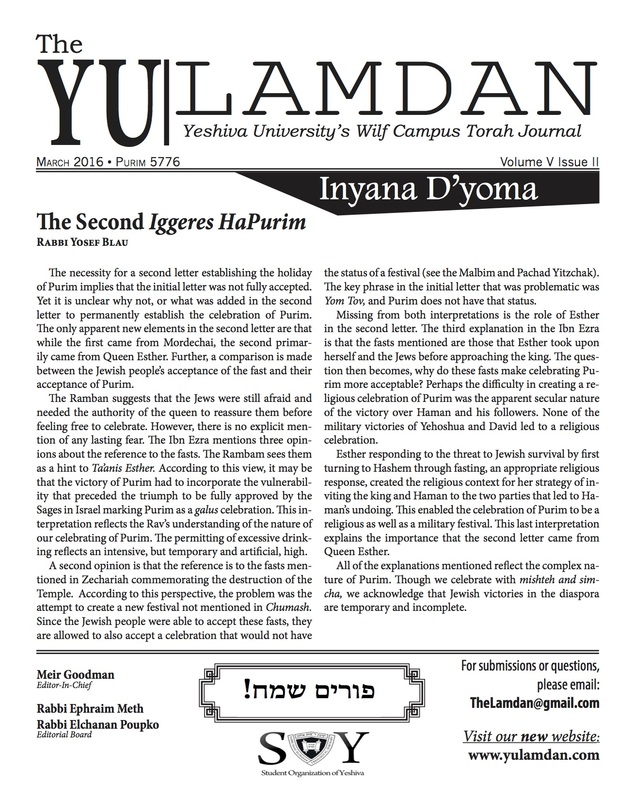 The Rambam sees them as a hint to Ta’anis Esther. According to this view, it may be that the victory of Purim had to incorporate the vulnerability that preceded the triumph to be fully approved by the Sages in Israel marking Purim as a galus celebration. This interpretation reflects the Rav’s understanding of the nature of our celebrating of Purim. The permitting of excessive drinking reflects an intensive, but temporary and artificial, high. A second opinion is that the reference is to the fasts mentioned in Zechariah commemorating the destruction of the Temple. According to this perspective, the problem was the attempt to create a new festival not mentioned in Chumash. Since the Jewish people were able to accept these fasts, they are allowed to also accept a celebration that would not have the status of a festival (see the Malbim and Pachad Yitzchak). The key phrase in the initial letter that was problematic was Yom Tov, and Purim does not have that status. Missing from both interpretations is the role of Esther in the second letter. The third explanation in the Ibn Ezra is that the fasts mentioned are those that Esther took upon herself and the Jews before approaching the king. The question then becomes, why do these fasts make celebrating Purim more acceptable? Perhaps the difficulty in creating a religious celebration of Purim was the apparent secular nature of the victory over Haman and his followers. None of the military victories of Yehoshua and David led to a religious celebration. Esther responding to the threat to Jewish survival by first turning to Hashem through fasting, an appropriate religious response, created the religious context for her strategy of inviting the king and Haman to the two parties that led to Haman’s undoing. This enabled the celebration of Purim to be a religious as well as a military festival. This last interpretation explains the importance that the second letter came from Queen Esther. All of the explanations mentioned reflect the complex nature of Purim. Though we celebrate with mishteh and simcha, we acknowledge that Jewish victories in the diaspora are temporary and incomplete.